French Fizz to the delight of her big group of lady owners delivered a well-deserved all the way win in the Metcon Steel Geelong SV 3YO Fillies Maiden Plate over 1200m on Sunday. After three runners-up cheques from her first six starts, all the planets aligned courtesy of a great front-running ride by Dean Yendall. With the blinkers removed after over-racing last start at Mornington, she pinged the gates in her usual fashion and with no pressure from others to lead, Dean let her take up the running. After racing truly, she extended nicely in the home straight and proved too strong for a closing group of challengers to win by a half length. 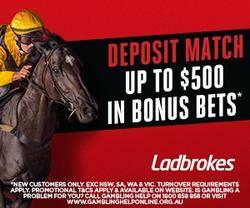 The cream on top of the win was the bonus money won through the Vobis system. Super Vobis and Vobis Gold winnings added an extra $22,400 to the winning prizemoney of $19,250. Another homebred filly the advantage of getting involved with horses bred by Darren & Liz is they will all be Vobis paid up. From seven life time starts, all during her first preparation, the 3YO daughter of Epaulette has netted $67,475 in prizemoney of which $33,600 is from the Vobis scheme - almost half her earnings. The win has earned her a spell where she will spend six weeks at Manningtree Park, before coming back into training. The break will allow her to mature further and hopefully help her take the next step in her career. One of three horses that involves Women's Racing ownership, she now joins Condover Hall and Lady Makfi as winners. All three are trained by the state's leading trainer Darren Weir. Congratulations to all involved, a normally quiet Sunday at the races was 'fizzed-up' with a few extra bubbles in the Winning owner's room. If you would like to race one of our homebreds click here, we have one Exosphere filly left on our books to be trained by Mick Price at Caulfield.